Today was a fun afternoon to be in my classroom. 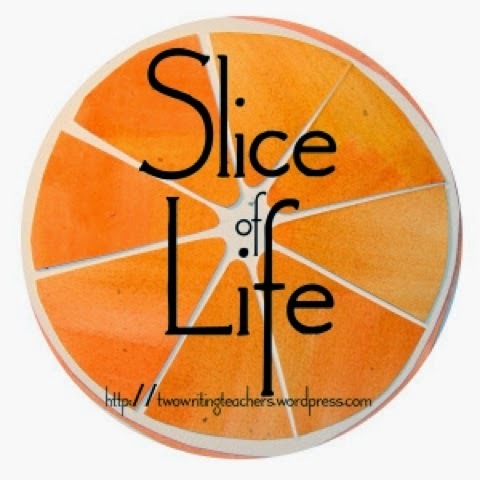 Not only did we do our Independent Daily Reading, #bookaday read aloud, Slicing and sharing, but we also has a Slice of Life visitor! A friend of mine, Jen Vincent, @teachmentortexts, who lives only an hour away, had the day off and asked if she could visit my classroom. I was thrilled to be able to show her my school, and even more, to have a real life Slice of Life professional (aka: she does the year long Slices) in my room to talk to my 7th graders the first time we’ve done this. It was exciting to see things from my eyes 12 days into this, and also from her eyes as someone who doesn’t live in this room with these students. I’ve been so happy with where things have been going since starting the Slice of Life Classroom Challenge, and having Jen visit today and share thoughts, ideas, and questions, gave me the push to keep going, and ideas for things to remind my students about as we move forward (and things to remember for getting started next year). I love that she also showed one of my classes her writer’s notebook where she planned out her Slice of Life ideas and keeps a topic list. Plus, it’s always good to see and get a hug from a friend who you don’t get to see very often. Thank goodness for twitter and the connections I’ve made there! How awesome! I wish more of my twitter pals lived closer to me! I also sometimes wish I had a "real" classroom of kids I could slice with. Hooray for you that you were able to have Jen visit your kids - what a treat for them! Always good to hear new ideas for slicing. That is a really neat opportunity for you and your students. I bet they got a lot out of that experience! Thanks for letting me visit! Your school is amazing. I loved talking to your students, seeing where you teach, and touring the building. Such a great experience.